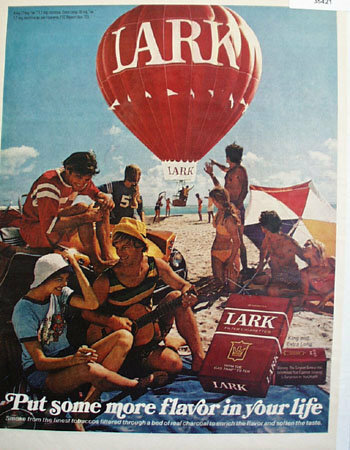 Lark Cigarette Hot Air Balloon 1972 Ad. Lark Cigarette Hot Air Balloon 1972 Ad. This color August 18, 1972 ad states put some more flavor in your life. Smoke from the finest tobaccos filtered through a bed of real charcoal. Picture shows Lark Hot air balloon landing on sandy beach. A group of young people is on beach in bathing suits. girl has hand on head showing off diamond. Boy is playing Guitar. A good beach scene. Magazine tear sheet picture is taken through plastic and may show wrinkles or crookedness that is not In the ad. This original magazine tear sheet measures 9 3/4 inches wide by 13 1/4 inches tall. Items Similar To "Lark Cigarette Hot Air Balloon 1972 Ad."